Apple cider vinegar has long been known as an effective natural remedy for a number of conditions. One common problem that people of all hair types experience is dandruff /seborrheic dermatitis, resulting in dry, itchy flaky scalp. Dandruff is not caused by dryness of the scalp as is commonly believed; rather it is caused by the overgrowth of a yeast commonly found on the skin and scalp (Malassezia) which results in an increase in the production and shedding of skin cells. This increased cell turnover results in flakes which then become visible to the eye. Oiling of the scalp only temporarily masks the problem, but does not treat the actual cause. Apple cider vinegar is a natural and inexpensive way to treat these issues by balancing the pH of the scalp and killing bacteria and the yeast that causes dandruff and seborrheic dermatitis. In addition to dandruff treatment, apple cider vinegar also works as a great natural clarifier. Acetic acid, the main ingredient in apple cider vinegar, removes buildup from styling products and shampoos, and helps to strengthen the hair by closing the cuticles on the hair shaft. Removal of buildup and smoothing of the hair cuticle promotes natural shine and leaves the hair lighter and softer. I have been battling dandruff and dermatitis issues for years, and no matter how often I washed and how thoroughly I scrubbed, no less than a day later the itchy, flaky patches would return on my scalp. I tried anti-dandruff shampoos such containing zinc pyrithione (ex. Head and Shoulders) and coal tar (ex. Neutrogena T-Gel) with only minimal success. I was also not a huge fan of putting all these artificial chemicals on my scalp and hair and didn not like how it interfered with the scent of my herbal shampoo. I decided to return to using apple cider vinegar rinses, this time with a two part pre- and post-shampoo treatment, and have been very pleased with the results. I've noticed a drastic improvement in the flaking and the rinses soothed the intense itching on my scalp. Mix all ingredients into a spray bottle and shake well. Spray or pour mixture onto hair, focusing primarily on the scalp. Wrap hair in a towel for 30 minutes to 1 hour. Follow with normal shampooing. Tea tree oil has natural antiseptic properties and also helps to kill the fungus that causes dandruff. For additional clarifying, you can add lemon juice which also helps to remove excess oil and debris. I would not recommend using the lemon juice too frequently on in excessive amounts, as you don't want to completely strip the hair and scalp of its natural oils. Pour water into a small saucepan and add rosemary. Cover and simmer on medium-low for 15-20 minutes. Strain rosemary out of water. Add apple cider vinegar. ALLOW TO COOL COMPLETELY. Transfer mixture to a bottle and add tea tree oil and essential oils. After shampooing, pour rinse over scalp and hair. Do NOT rinse. Rosemary is also a good ingredient for soothing itchy, flaky scalp and works well in conjunction with the apple cider vinegar and the tea tree oil to treat dandruff. In additional, rosemary is believed to stimulate hair follicles to promote hair growth and slow hair loss. Rosemary is good for people with dark hair and helps to bring out natural highlights and shine, and it also leaves your hair smelling wonderful. I find that the rosemary alone makes for a great scent, but you can also experiment with adding different essential oils to find a scent combination that you like. 1. Do not worry about the apple cider vinegar smell. It will dissipate as the hair dries. The rosemary further helps to counter the apple cider vinegar smell. 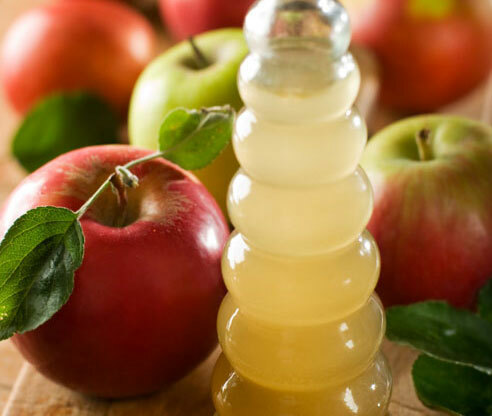 If you are still bothered by the smell, reduce the amount of apple cider vinegar used. 2. You should make the rosemary infused apple cider vinegar rinse several hours or days before you have to shampoo to allow it to completely cool. It may be comfortable to the touch but still too hot on your scalp (I discovered this the hard way). The rinse should be room temperature. If you do make it right before you shampoo, add plenty of ice cubes to cool the rinse completely. 3. Store extra rinse in the refrigerator to keep it fresh. Making a double batch will save you time and you won't have to worry about the temperature issue. You can microwave it for a few seconds if the rinse is uncomfortably cold (especially if you use it in the shower; ice cold rinse does NOT feel good running down your back). 4. The rosemary can be used more than once. After you strain the rosemary out of the rinse, lay it flat on a paper towel and allow to dry, then store it in a plastic bag or container. You can use the dried rosemary of two batches to make an additional batch. Can this be used on chemically treated or rlaxed hair? can this treatment be used on relaxed hair? Yes, it can be used on any type of hair. It's just good for clarifying in general. Are these meant to be used daily or once/twice week or how often? You can use it as often as you'd like. For awhile I was using it every time I washed my hair to treat my scalp, but now that I've resolved my scalp issues (for the most part) I only use it once or twice a month for clarifying. OMG, I'm trying this right now and it already feels amazing. Wore too many hats during college and my scalp got very itchy in the back!